.44 Magnum is probably not the first caliber that comes to mind when one thinks of snubnose revolvers. After looking at these beauties, you may change your mind. And, after all, if you’ve only got six shots, why not make it a howitzer? The stainless model 629 was introduced in 1979 with a 6″ barrel. There are rare 5″ and 8 3/8″ prototypes built at that time, but the 5″ and 8 3/8″ versions didn’t go into production until 1981. 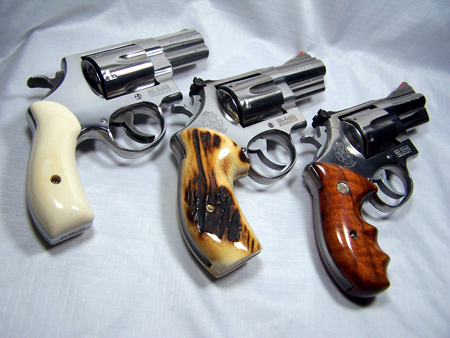 The 3″ barreled snubnose version was begun in 1985 as the Model 629-1 Combat Magnum. A special run of 5,000 was done for Lew Horton Distributing. Unfortunately, they are no longer in regular production, but they can still be special ordered from Smith & Wesson’s Performance Center, but they don’t even quote a price on their web site if that tells you anything. The Model 629 weighs 39 ounces empty, the same weight as a Government Model .45 automatic. It’s a large, beautiful N-frame revolver. When you fill your hand with one of these, you know you have a serious revolver in your hand. If the .44 Magnum is too much of a load for regular shooting, you can also run .44 Special through these guns. I am of the opinion that the .44 Special is an under-appreciated self-defense round. Its ballistics are very close to the .45 ACP. The Model 629 gives up one of the great assets of the standard snubnose: the lightweight conceal-ability of the j-frame and similar snubs. In doing so, it gains the formidable stopping power of the .44 Magnum that will easily deal with a bear or wild pig. Stoked with .44 Special hollowpoint ammunition, it becomes a highly effective personal defense handgun.